For a number of reasons, we expect to see footage from Joss Whedon’s The Avengers: Age of Ultron when Marvel hosts its panel from the stage of Hall H at San Diego Comic-Con. And now, we think we know what we will see if and when this footage screens. Tony Stark holding Loki’s stick from The Avengers. A scene in Africa with Captain America and Black Widow on a motorway. [And] Joss talking about the Avengers Tower set being ‘the most beautiful he’s ever worked on.’"
RadioTimes added to the footage descriptions, saying that the Avengers Tower will be built from the remains of Stark Tower (which was banged up in the first Avengers film), and that Scarlet Witch and Quicksilver both make brief appearances in the footage. So why are we jumping to the conclusion that this footage will screen in San Diego? Because Mark Ruffalo already let the cat out of the bag that the entire Avengers cast is flying to Comic-Con to attend the Hall H panel. And because Marvel, above all other studios, knows how to do Hall H right. Their panel, year after year, is the one that leaves fans’ jaws on floors. And they blew the roof off of Hall H last year with the simple reveal that the title of The Avengers 2 would be Age of Ultron. 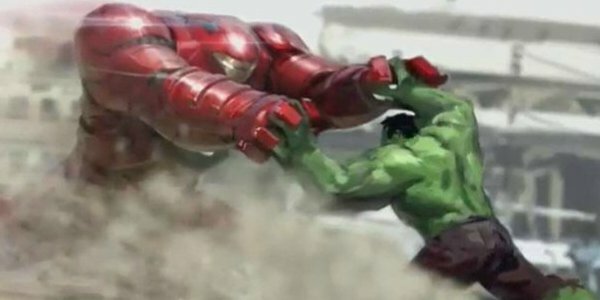 Can you imagine the deafening roar that would occur if they had pre-viz footage of Iron Man fighting Hulk in his Hulkbuster suit? Marvel will hold court over Comic-Con on Saturday, July 26. We will have up-to-the-minute coverage of their panel as Comic-Con rolls on.